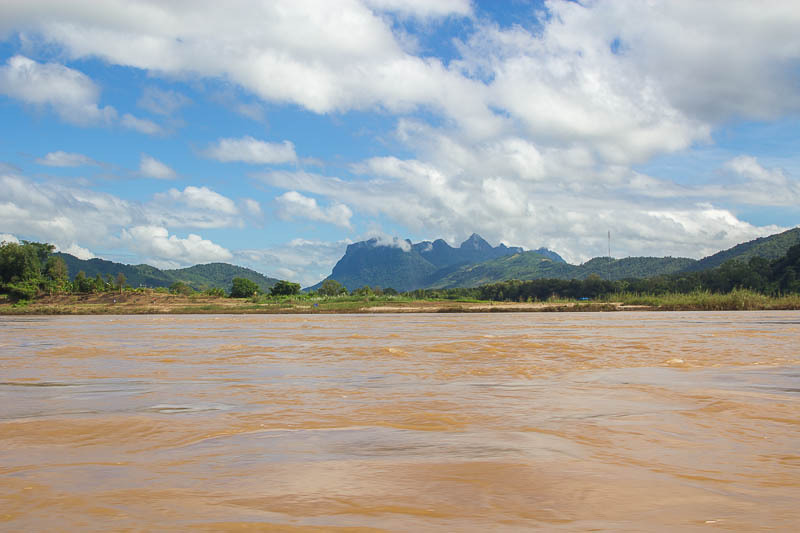 Besides Kuang Si Waterfalls, Pak Ou Caves is one of the most common destinations that travellers in Luang Prabang visit. 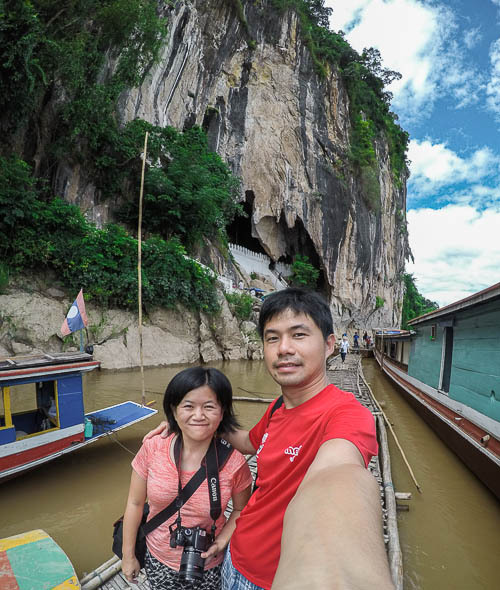 We’ve seen photos and videos of Pak Ou Caves and we were so eager to see the caves in person. 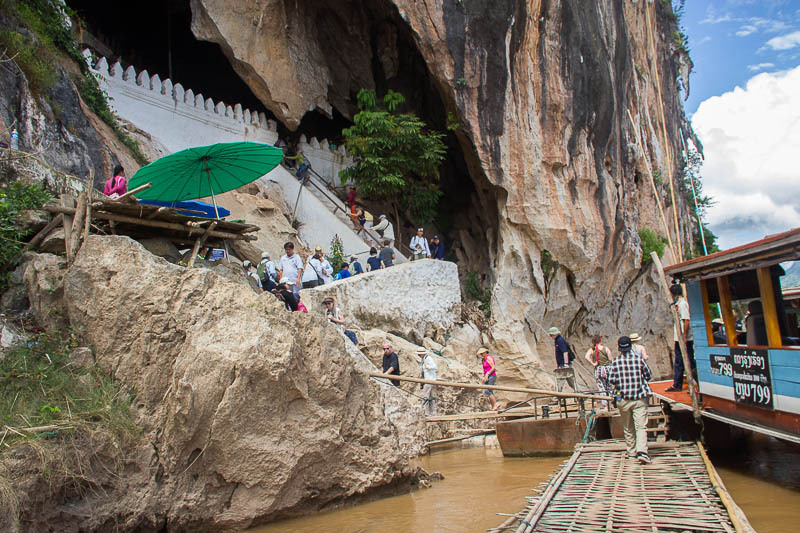 There are many ways to go to Pak Ou Caves. 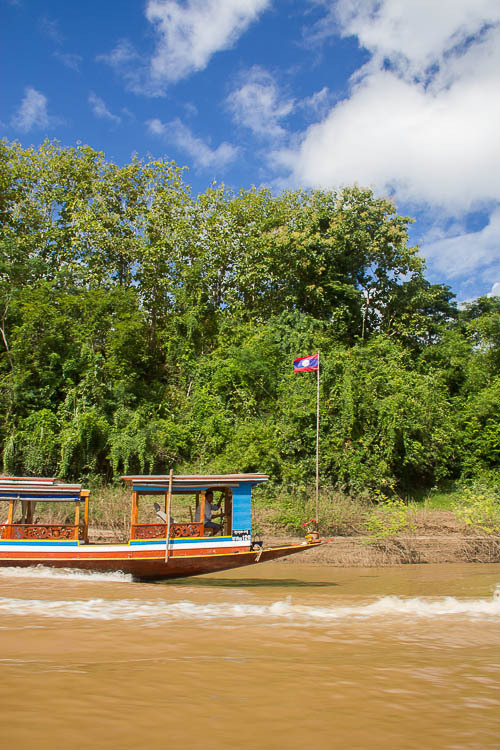 One can take a boat, ride a motorbike or rent a car. 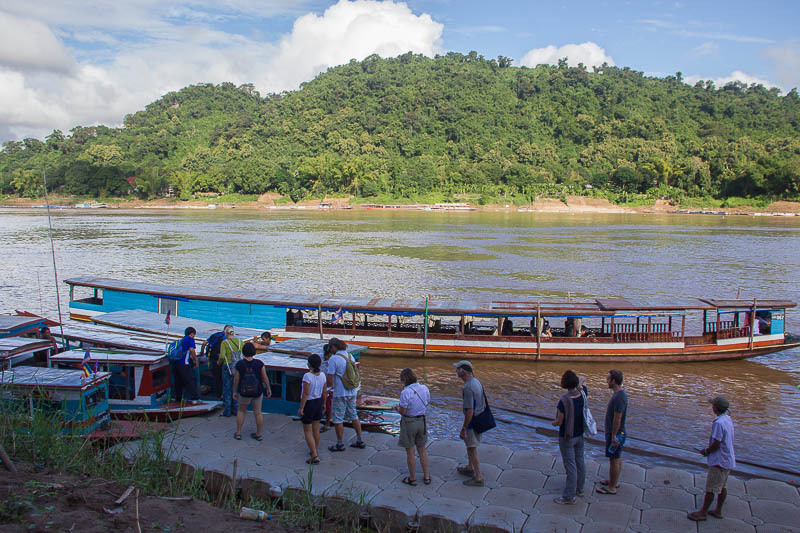 There are also plenty of tour agents in Luang Prabang that sell half day or full day tours. 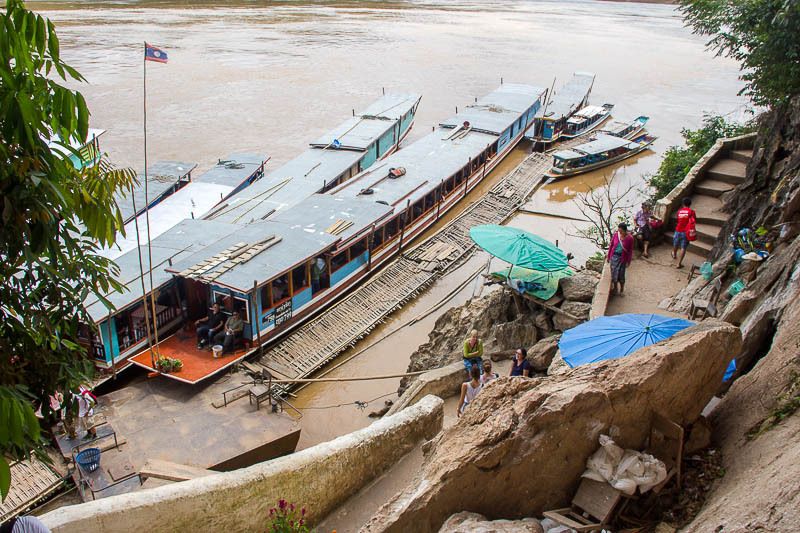 As independent travellers, we decided to join the public boats. 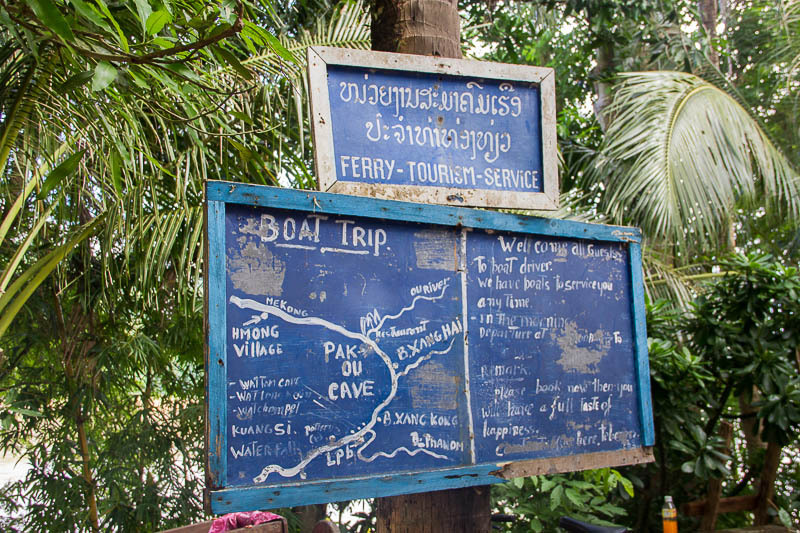 The boats to Pak Ou Caves depart from Ferry Tourism Service, which is located at opposite Saffron Coffee (see map below). The boat leaves at 8.30am. You can buy the ticket at the counter. The boat ticket costs 65,000 kips per person. After buying the ticket, we sat down and waited for our departure. The map showing the route of the boat trip! At 8.30am, we were all divided into different groups. Each group follows a designated boat driver. There were about 6 to 8 guests in each boat. 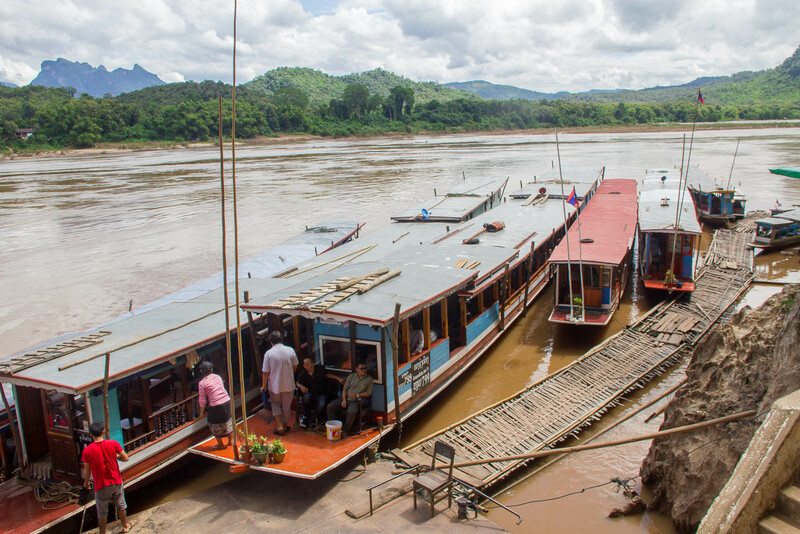 The boat trip from Luang Prabang town to Pak Ou Caves is against the river current and takes more than 2 hours, including stopover at Whiskey Village. Honestly, I really enjoyed the slow boat ride. 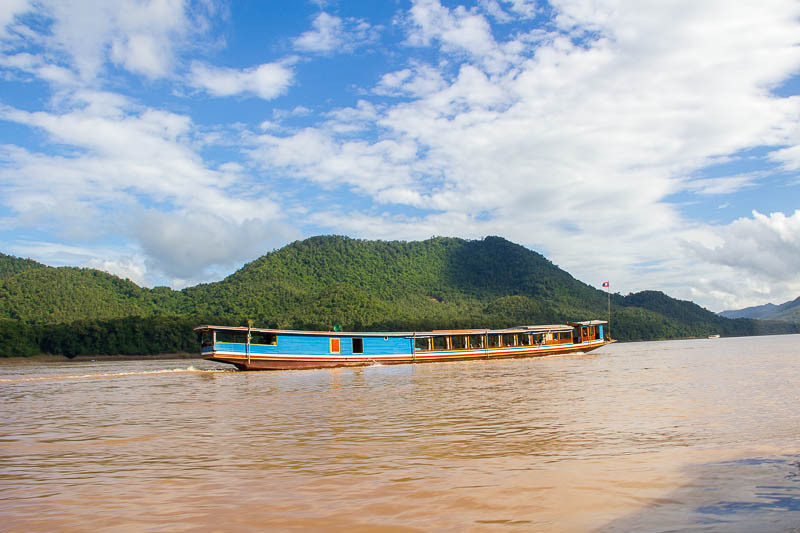 It somehow reminded me of the boat trip that we took in Inle Lake, Myanmar, three years ago. The blue sky and puffy clouds was so beautiful, nevermind that the color of the water isn’t remarkable. 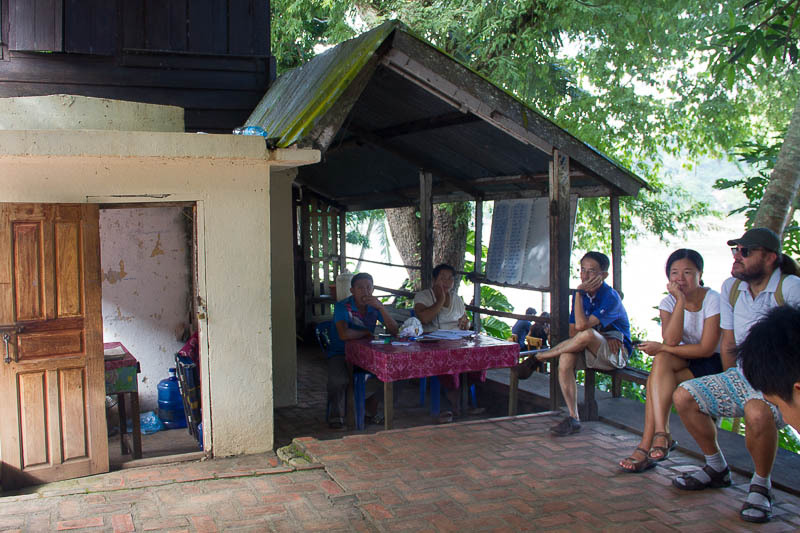 About 1 hour into the boat ride, we arrived at Ban Xang Hai Village, more popularly-known as Whiskey Village. 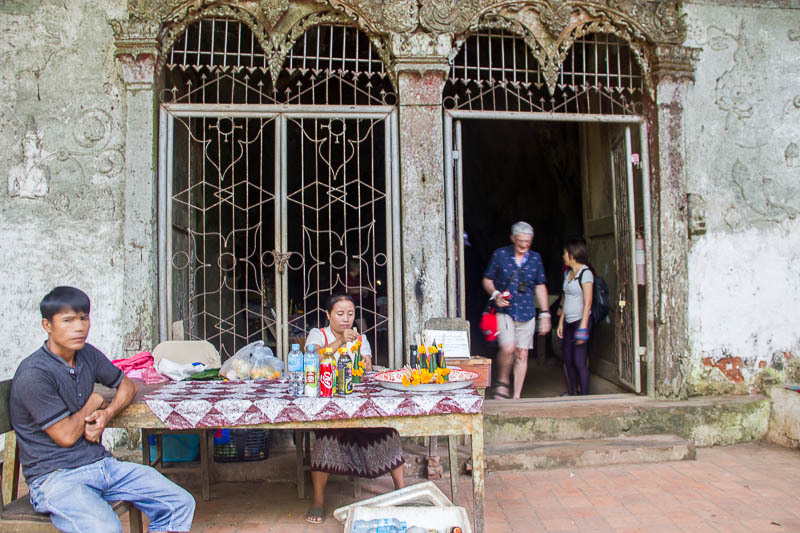 The first thing that greeted us after we climbed up the stairs to the village was a guy offering free samples of whiskey. He brought us to a table of whiskey jars that has exotic animals inside. Out of curiosity, we tried a few. Then, we slowly made a quiet disappearance when the guy was talking to other people. 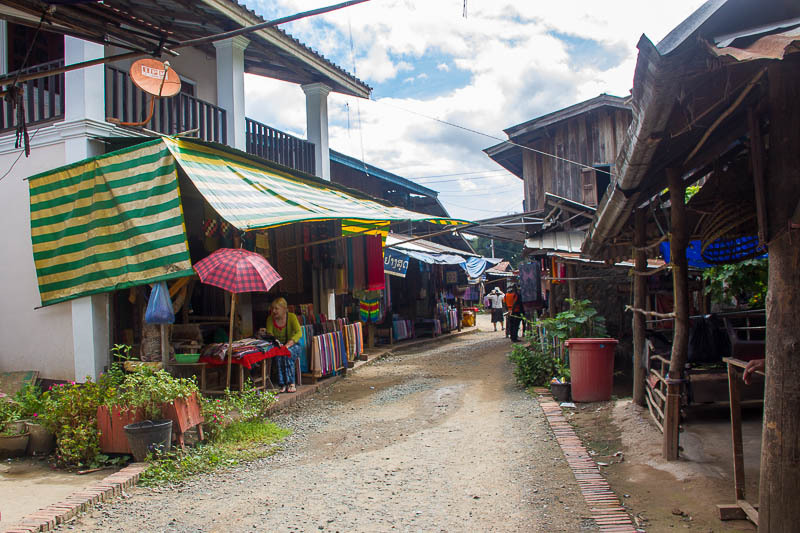 We looked around the village and decided to buy a few souvenirs before making our way back to the boat. 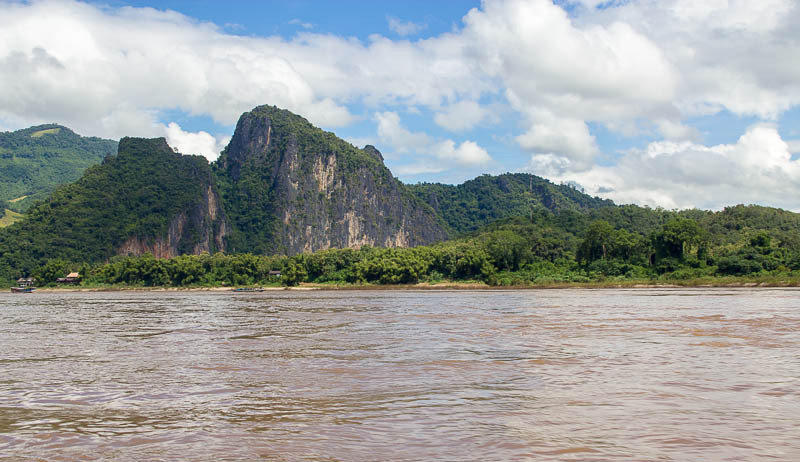 Eventually we arrived at Pak Ou Caves. The boat driver told us that we had 40 minutes to explore the caves. To be honest, I was surprised. I felt that 40 minutes is too little. Anyway, we climbed up the stairs, bought tickets that cost 20,000 kips per person, and went to the cave located on our right immediately. 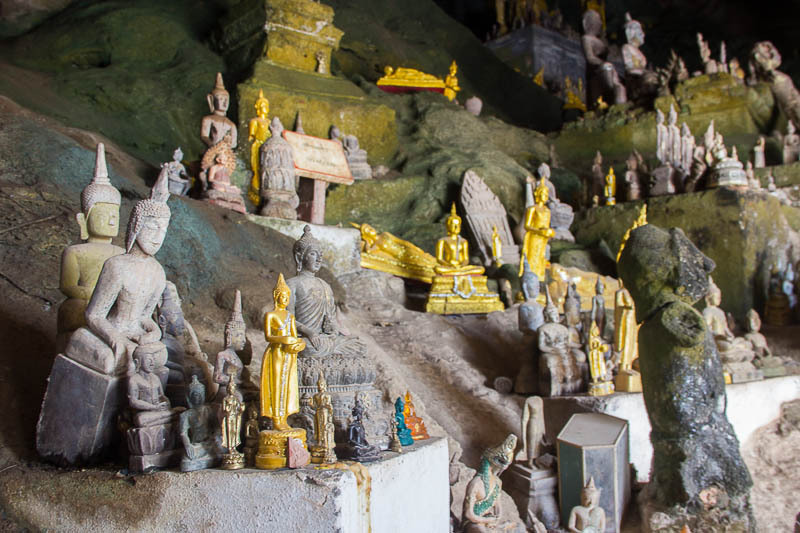 Inside the cave, there are thousands of buddha statues. 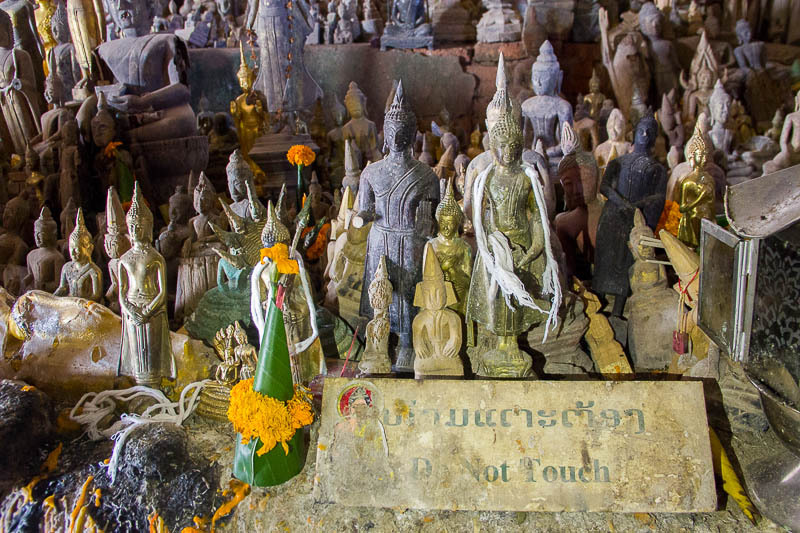 These statues are the retired damaged and old Buddha statues that are placed by locals and overseas pilgrims. If you wish to get close-up photo with the statues, use a long selfie stick! The cave is actually smaller than our imagination! Basically, we can see the whole cave within 3 minutes of entering the cave. Due to its small space, we were constantly squeezing with other visitors and avoiding blocking people who were taking photographs. We spent about 30 minutes in this Lower Cave. It’s quite a long time considering how small the cave is. 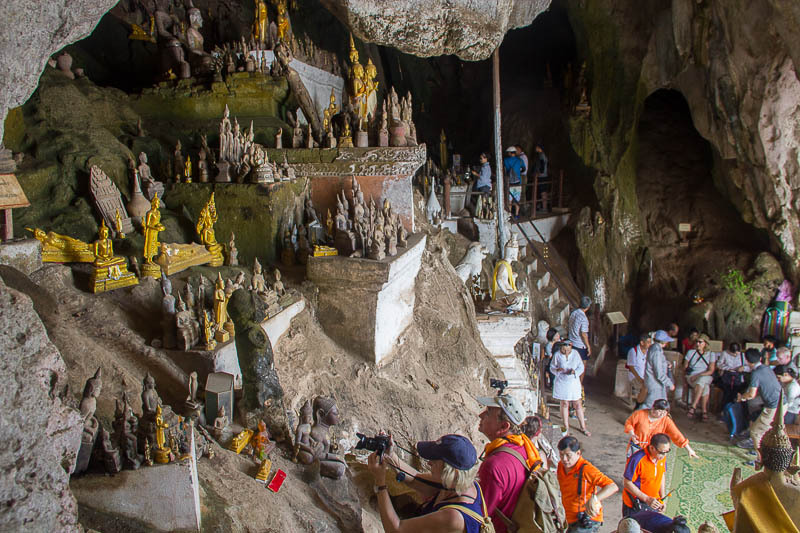 Blame it on our lack of research, we didn’t know there is more than 1 cave at Pak Ou Caves. There is a sign that said about Upper Caves at the ticket desk, but it was blocked by the staff! UGH!!! So, how did we find out about the Upper Cave? After coming out from Lower Cave, we decided to go to toilet before returning to the boat. On the way to toilet, we saw a signage pointing to Upper Cave! Then we realised, we’ve missed Upper Cave and we only had 10 minutes left! Just before we dashed up the stairs, a boy came to us to request for toilet fee of 5,000 kips. Shocked and unwilling to pay so much, we gave him 1,500 kips and he didn’t ask for more. Then, we climbed the stairs quickly to the Upper Cave. Contrary to the well-lit Lower Cave, the Upper Cave is almost completely dark. It’s impossible to take a photo with hand-held cameras, at least for me. Upper Cave is bigger and less crowded than Lower Cave. Tips: bring a torch to be able to see more inside Upper Cave; or tag along with someone who has a torch. 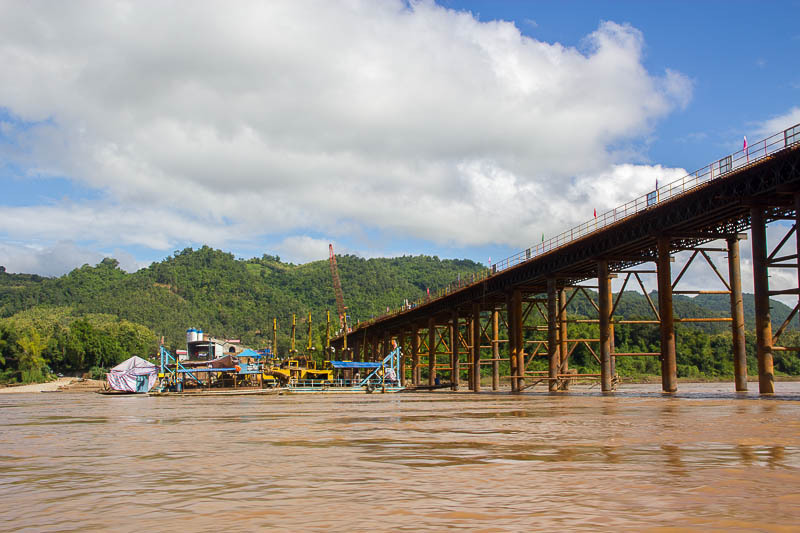 Our journey back to Luang Prabang town took only 1 hour because the boat moved in the same direction as the river’s current. We were back at the town at 12.30pm. There was no stopover during the return journey. I hate to say this but, frankly, I found the caves to be overrated. 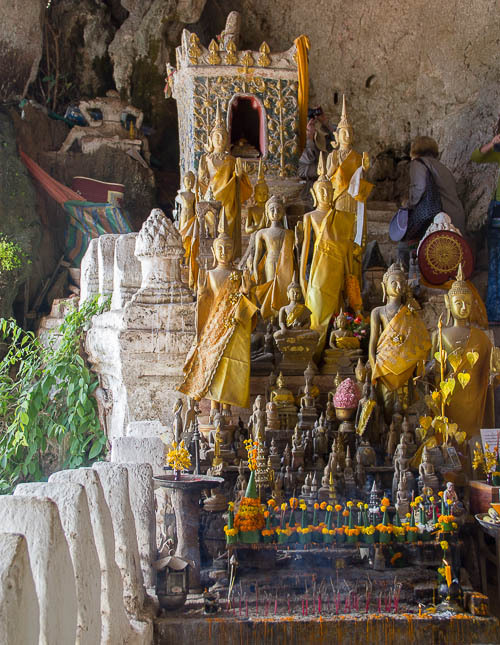 Probably that was because we spent way less for Kuang Si Waterfalls compared to Pak Ou Caves, and Kuang Si’s beauty is just unrivalled. 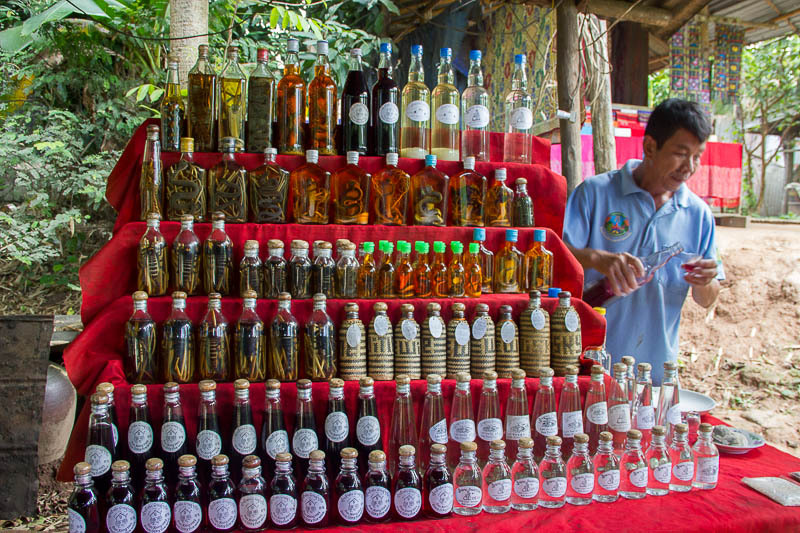 If you must choose between Kuang Si and Pak Ou, choose Kuang Si.